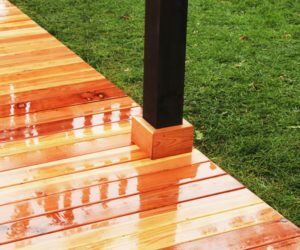 If you are building a deck, you might run into some architectural challenges. 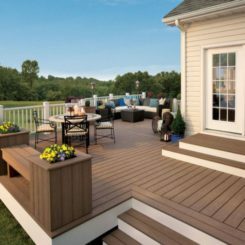 A right-angled deck is one thing, challenging enough to get right, but a curved deck adds quite a bit to the challenge. 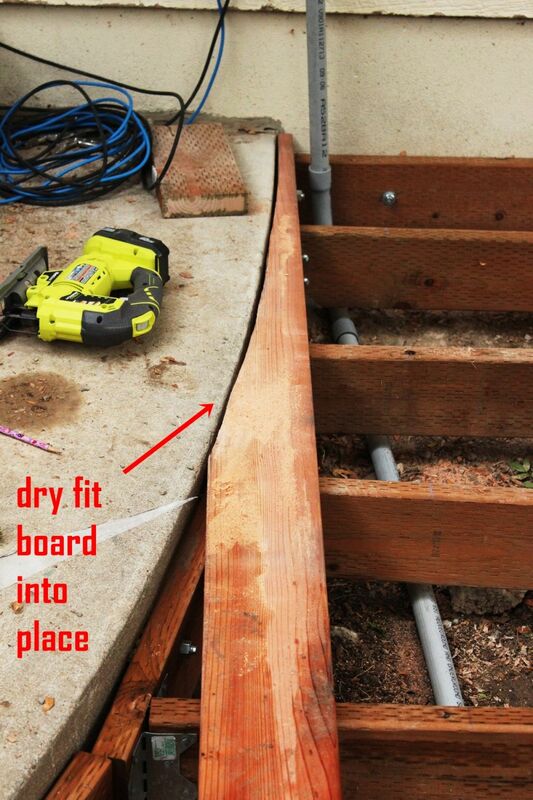 In this example, a redwood deck is being built up next to some existing curved concrete steps. 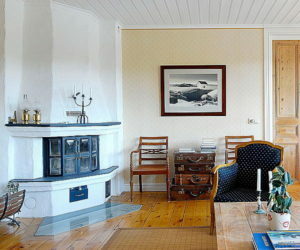 This requires that the wood be curved to match. 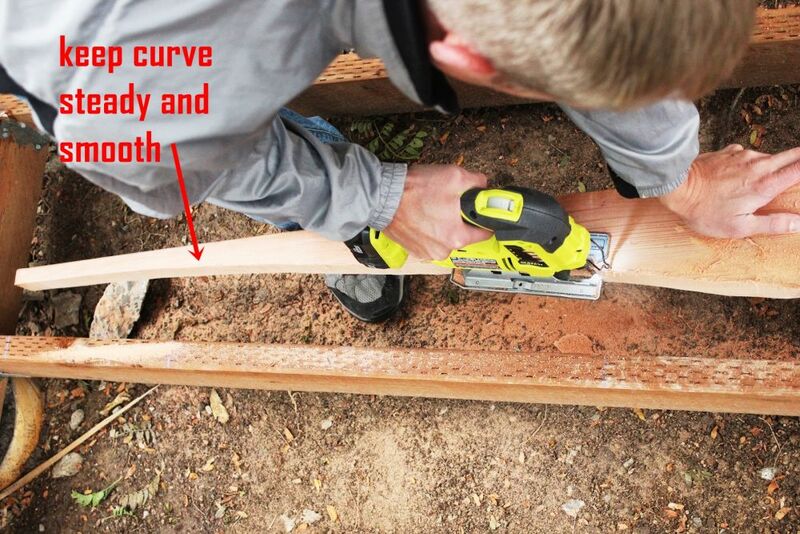 In this tutorial, we’ll show you step by step the most efficient and effective method we found for DIYing a curved wooden deck. We hope you find it useful as well. Note: The author is an experienced, although not professional, builder. Use the advice set forth in this tutorial at your own risk. 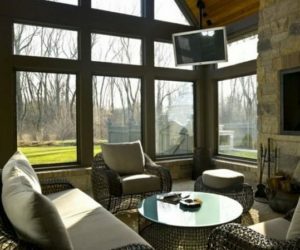 Always check building codes in your area before building. 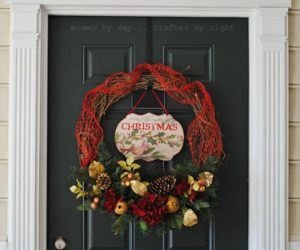 Neither the author nor Homedit is responsible for damages as a result of following this tutorial. 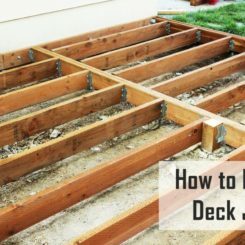 Before you begin installing your curved deck floor, you need to make sure you have your wall-mounted deck frame and deck floor joists in place first. 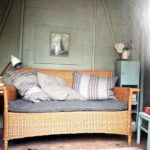 Note: We recommend starting with the outer curved floor board first, before laying any other deck flooring, for a couple of reasons. 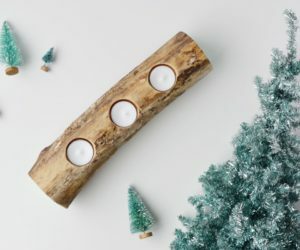 First, you want enough space at the top of your curved board that you can mount it effectively, rather than having it taper off into a tiny point. Second, looks can be deceiving, and it can be hard to eyeball what is perpendicular when you’re looking at a curve. 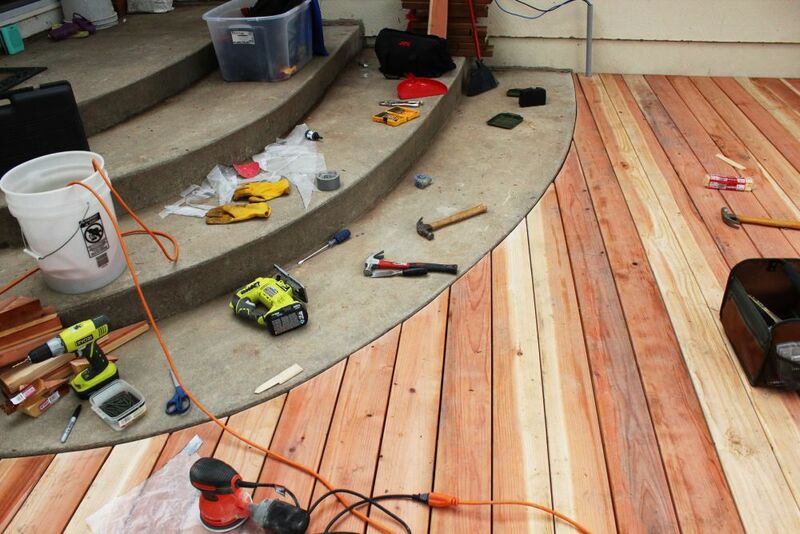 Aligning and laying this first curved board will improve the parallel nature of the entire deck floor. 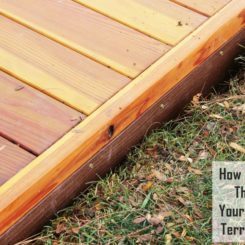 To this end, run a precisely perpendicular chalk line from your house or the edge of your deck to the other edge of your deck. 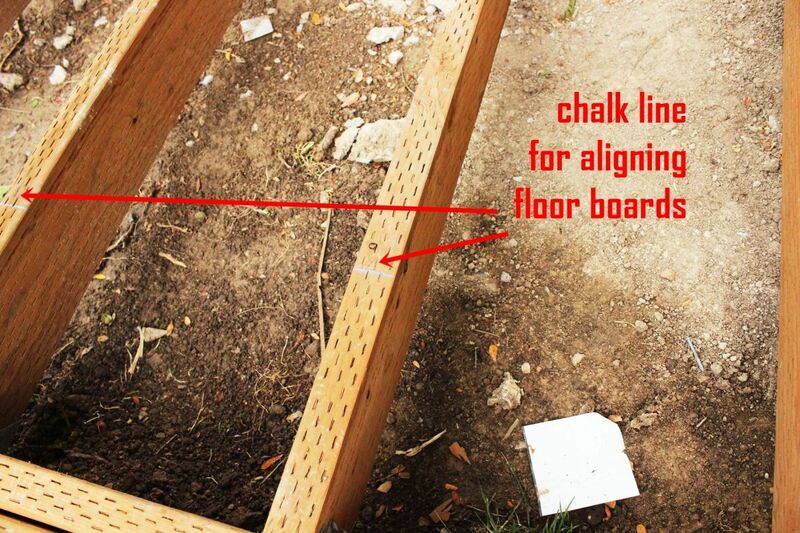 This chalk line should be perpendicular to your deck floor joists. 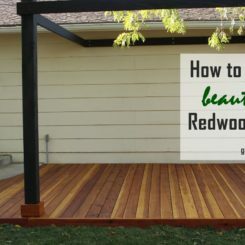 As the starting off point of your entire deck floor, this line will be critical in keeping the redwood deck floor boards parallel. Rip off several feet of wax paper. As in, the wax paper people use in baking. 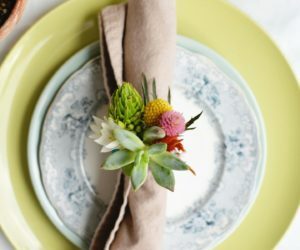 Align the edge of the wax paper with the chalk line (it should be out about 5” or 6” from the top of the curve) and tape into place so the wax paper runs straight. 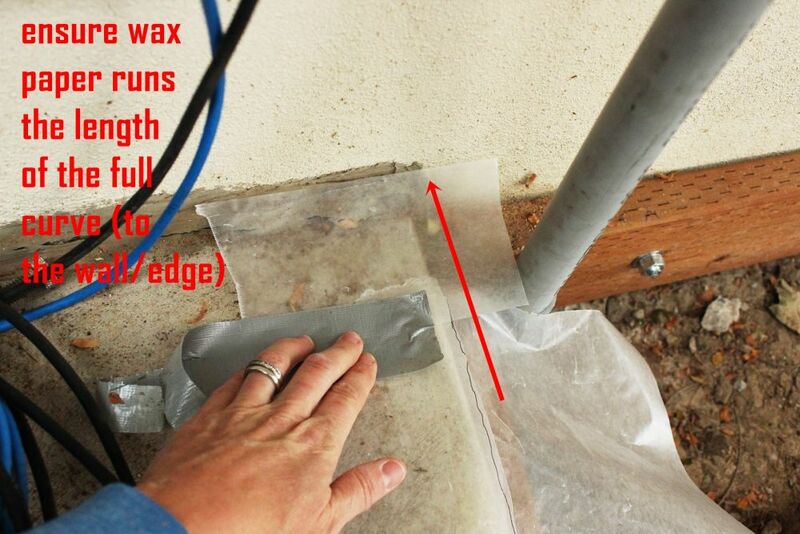 Keep the wax paper as flat and taut as possible, but don’t pull it tight. 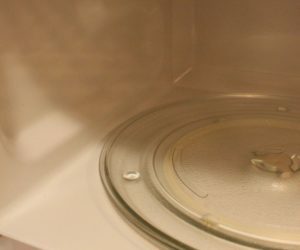 The taping won’t stick too well, and you’ll find yourself pulling the wax paper right off wherever it is you just taped it. But don’t worry; if you’re careful, this tape job will be good enough for our temporary purposes. 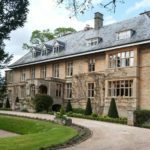 Use a dark permanent marker to lightly trace the edge of the curve. 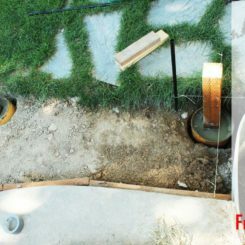 Keep the line precisely spaced along your concrete; so, if you start your line at the point of the concrete where it begins to curve down toward the ground, maintain that point all the way down your line. 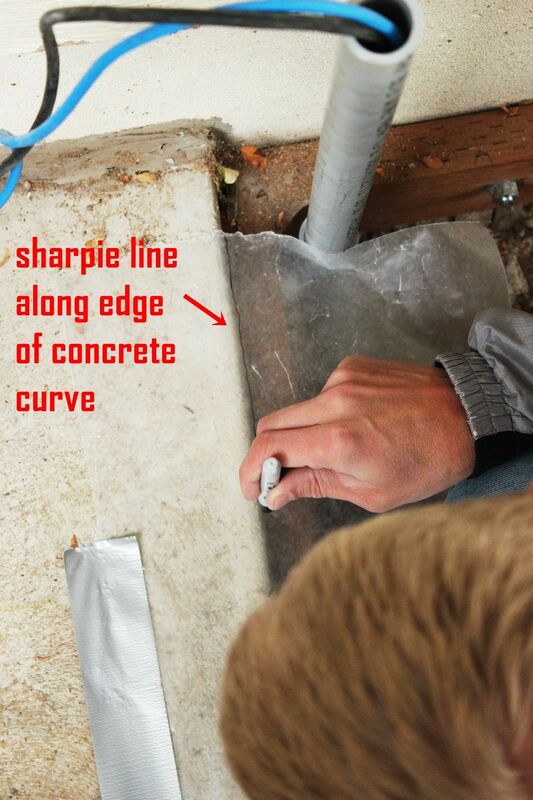 In this example, we drew the line about 1/4″ away from the concrete edge that we could see, but we maintained that same distance all the way down the curved line. 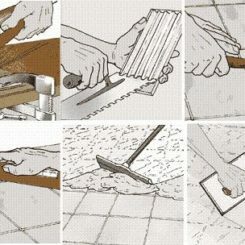 Carefully cut your wax paper along the line you just drew. 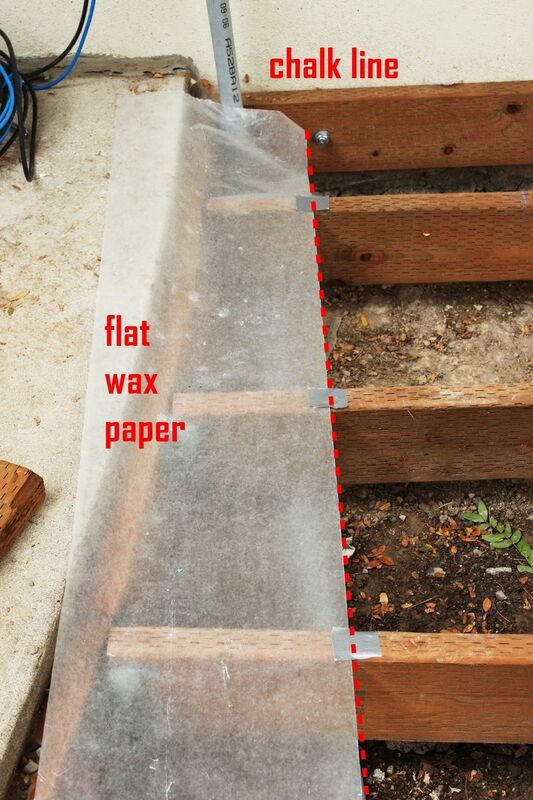 If necessary, and before you remove your wax paper, make sure the top of the paper is precisely aligned with the edge of your deck (in this case, the house wall). We had to tape a couple inches of wax paper onto the top to align it precisely. 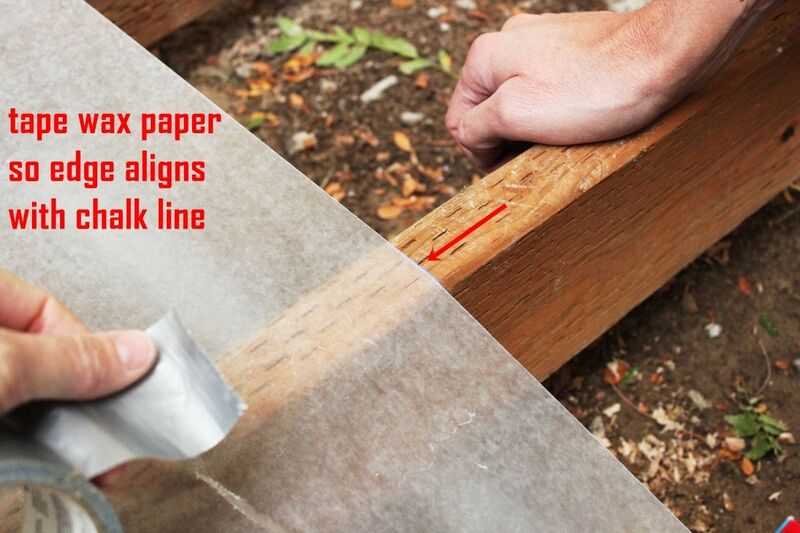 This is so you can align the wax paper onto your board exactly along the top end of your board. 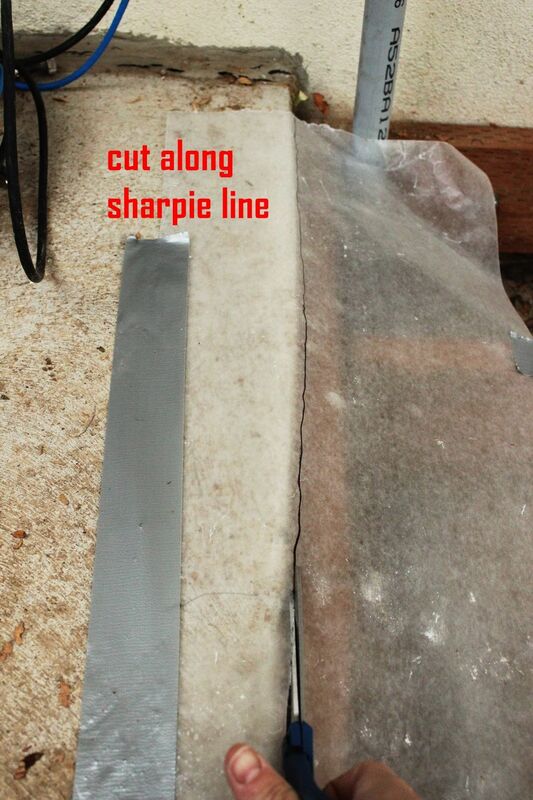 Tape or carefully hold the wax paper onto your board, aligning the top and straight side. 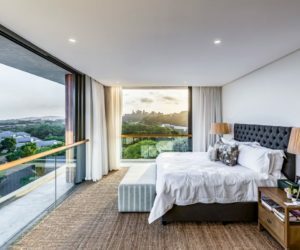 It’s important here to consider the amount of your board that you’re leaving intact. 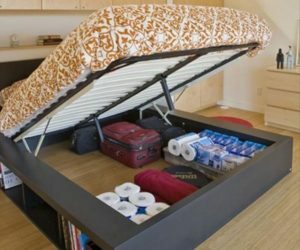 We recommend you leave at the very least 1” thickness of board all the way to the top; a little more is better, if you can. 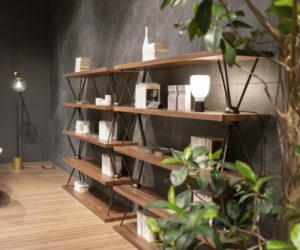 It’s a balancing act, though, because you also want to take care of as much of this very long curved edge as possible with one board. Install a new blade into your jigsaw, or at least make sure yours is very sharp. 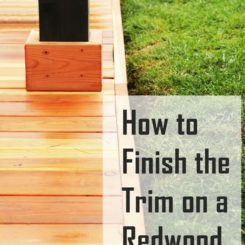 While it may not be complete precision cutting, you don’t want the jigsaw to chew up your curved edge if you can help it. And a sharp blade will help you with this. 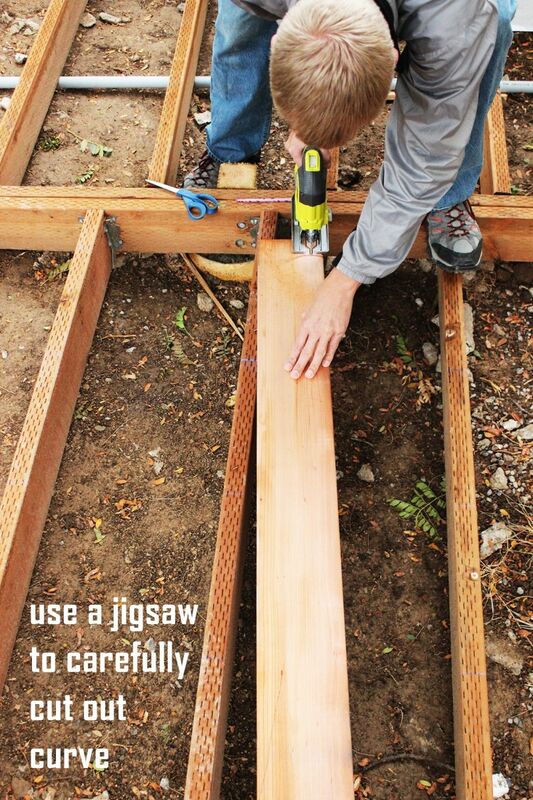 Use a jigsaw to carefully cut along your curve. 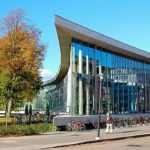 You may miss parts of the curve line initially; go back and get them again so that your curve is smooth and fits as precisely as you can manage. A jigsaw has a tendency to wobble a bit as you go. 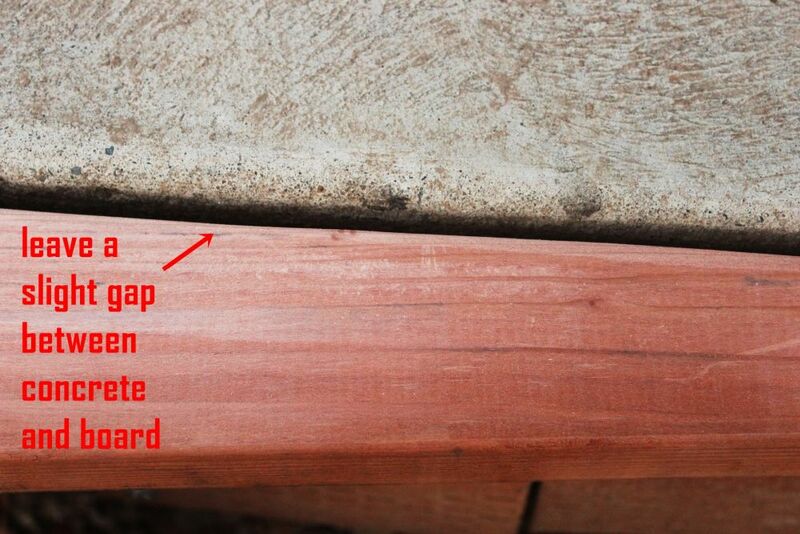 Just remember that if your curved line happens to have some bumps, your actual curved concrete step (or whatever) is likely very smooth. 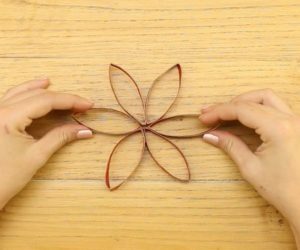 So, while you want to make sure you cut along the curved line, also be aware that the line’s small imperfections can be smoothed out with a smooth jigsaw cutting. 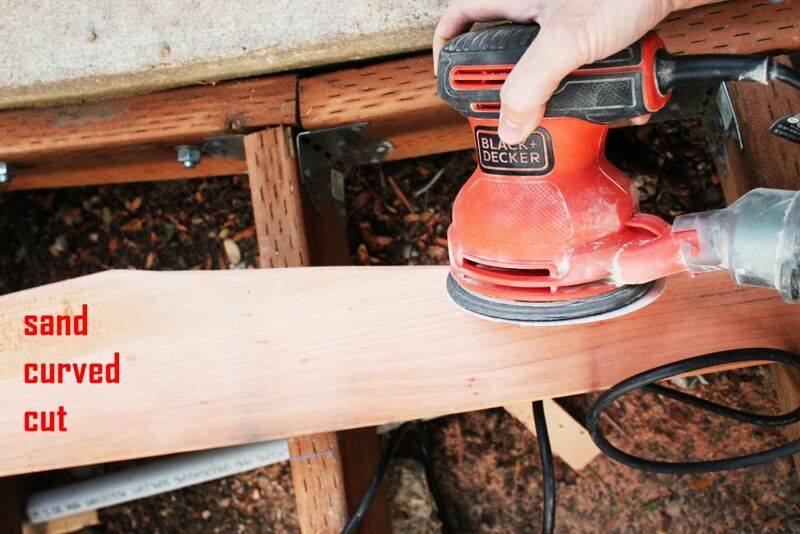 Dry fit the board to your curve. Make any adjustments needed. 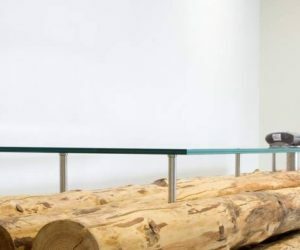 For example, if your gap between the board and the concrete is too great, consider cutting an inch or two off the top of your board to bring the whole thing in closer without sacrificing your curved cut. 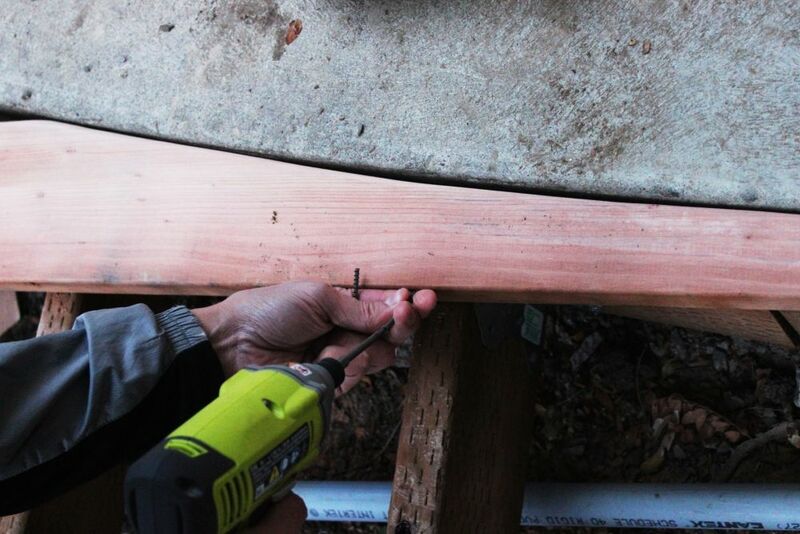 You can always sand out slightly wavy sections, if needed. 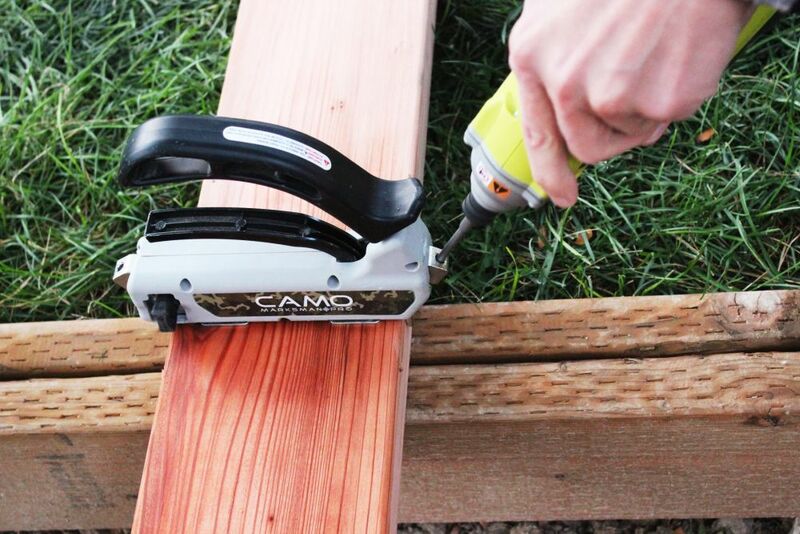 When the board fits perfectly in the curve, go ahead and lightly sand off the rough corner. Don’t get carried away here, though; you don’t want to change the curve. Lay the board down, this time exactly where you want it. 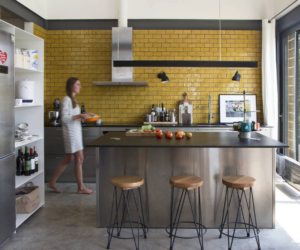 We recommend leaving a slight gap between concrete and wood for drainage purposes. Remember your chalk line? 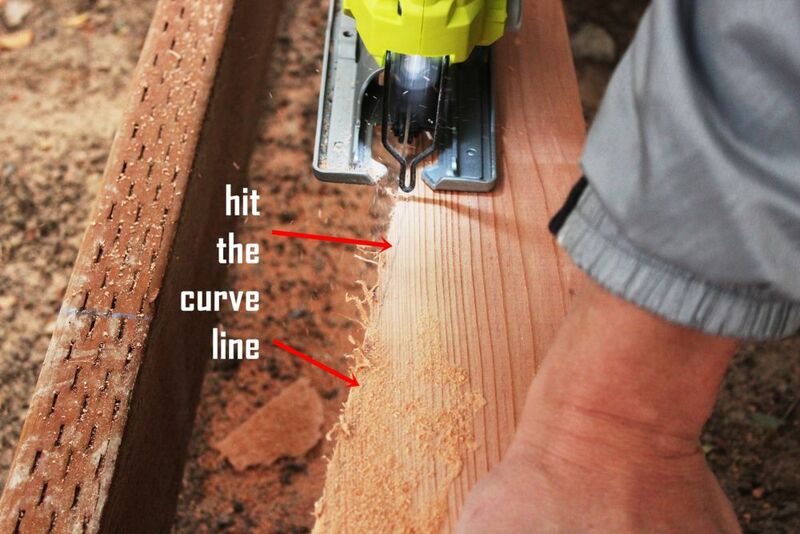 Align the curved-cut board perfectly with the chalk line. 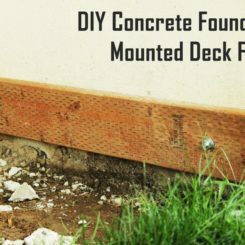 Make sure the curve still works at all parts of concrete connection. 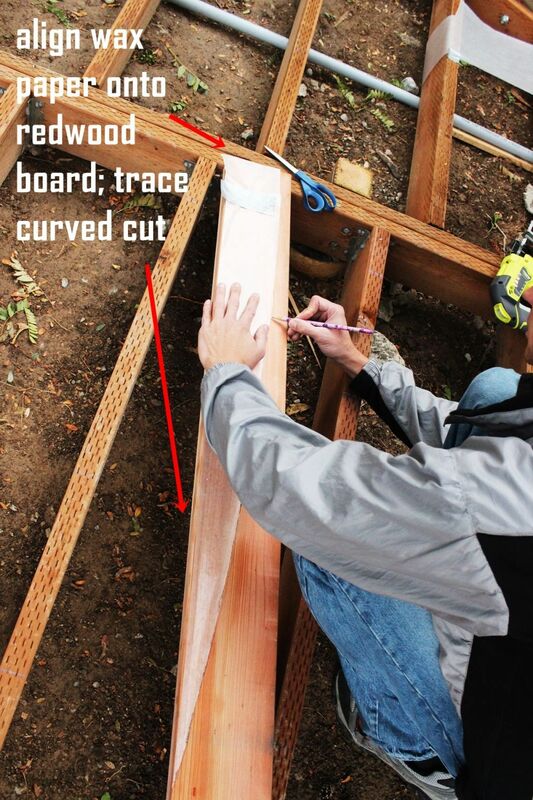 We’re going to be using Camo brand deck screws (2-3/8” for 2×6 redwood deck floor boards), because we’ll be using Camo deck spacers to install these curved pieces. 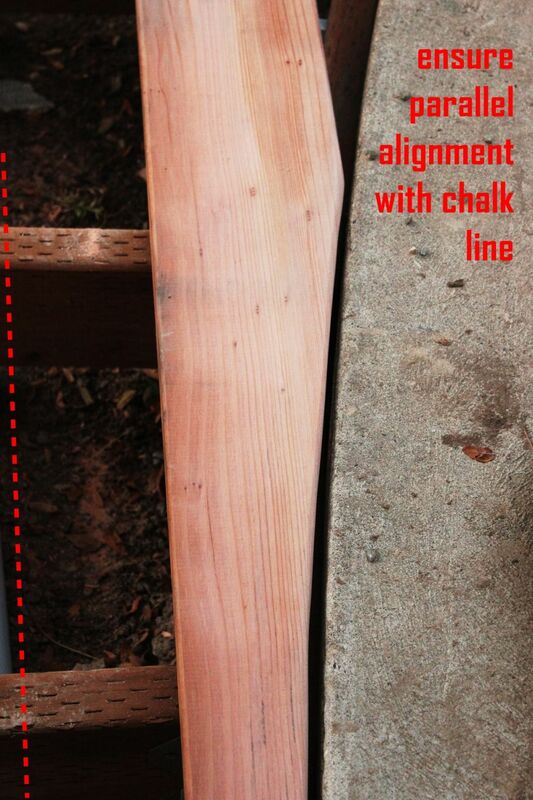 With the chalk line alignment precise, it’s time to install the curved edge of your redwood board. 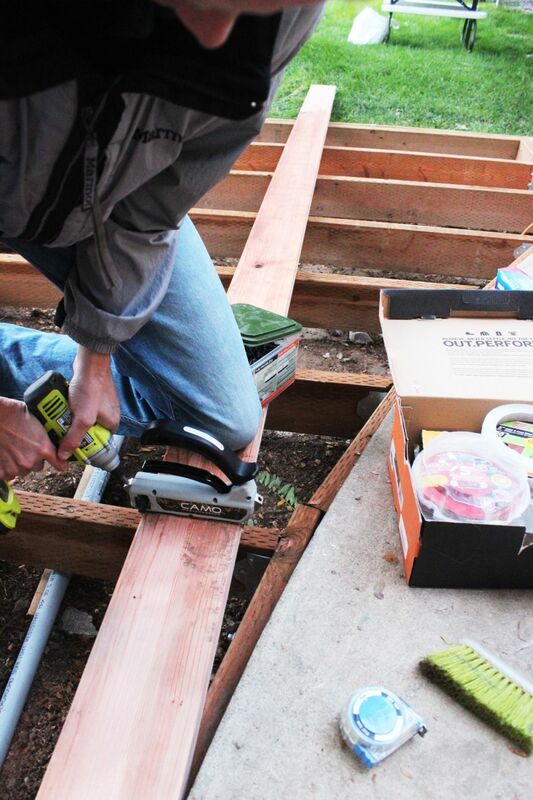 With a helper holding the board firmly in place, predrill (we recommend a 7/16” bit) at a rather sharp downward angle the parts of the curved board that lie over joists. Then install the Camo screws into the predrilled points. 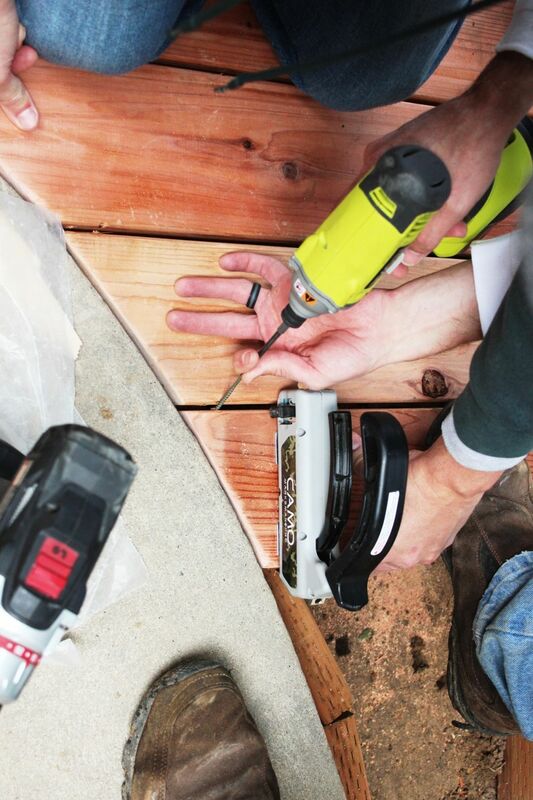 Next, you’ll want to throw a couple of screws onto the concrete side of the board. 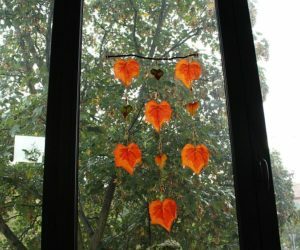 Don’t get carried away here, though; you don’t need these every few inches. 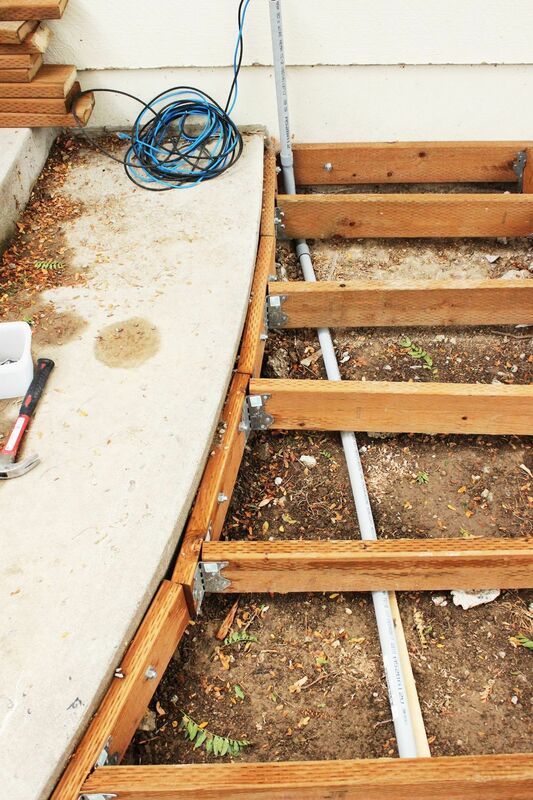 Predrill and screw into the point of the board that separates (curve-wise) from the concrete, into the wall-mounted deck frame. Then do the same at the top end of the board. 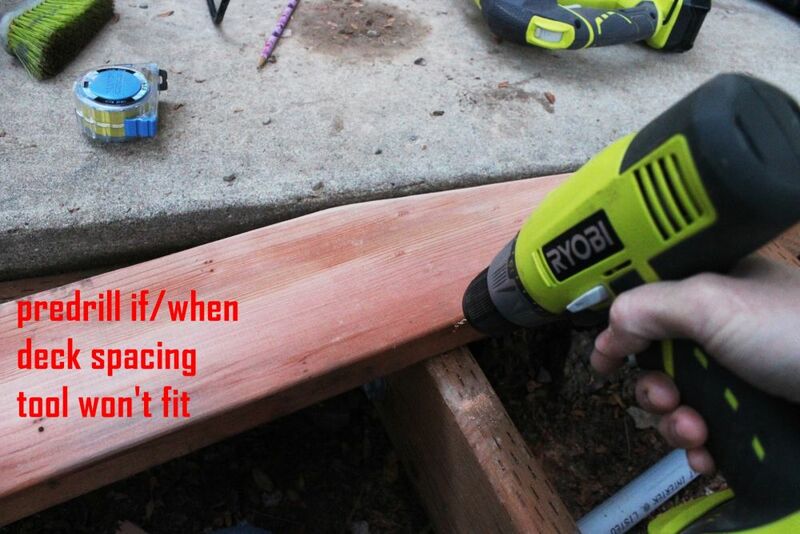 Depending on the length of the curve, you might want to install another one in the middle of the curve (if it’s several feet long), but you don’t necessarily need to even do that, because the board at that point is so narrow, and you’ve already attached it to the joist on the flat side of the board. 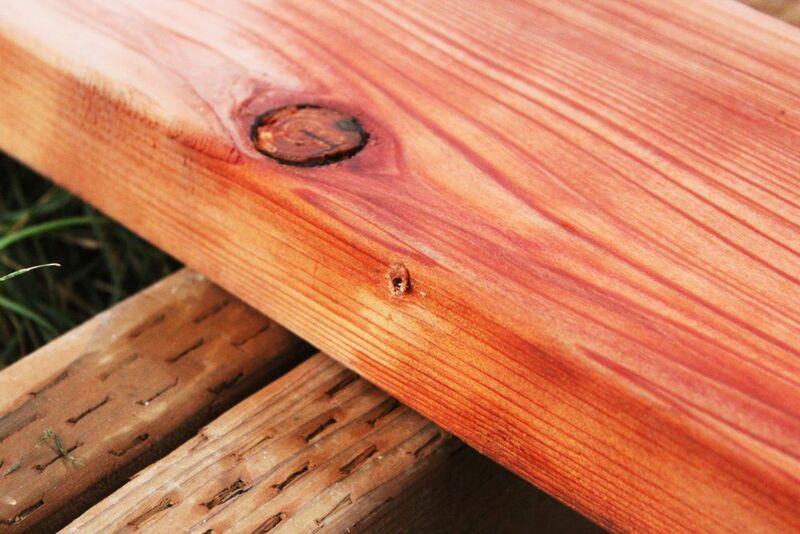 With the curved part of your board installed, it’s time to turn our attention to the bottom (flat) portion of the board. 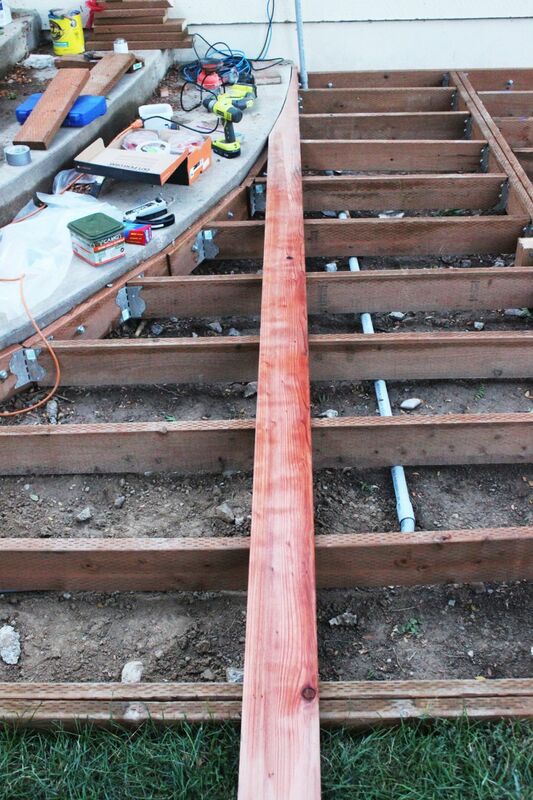 Work your way, joist by joist, down the length of your board toward the edge. 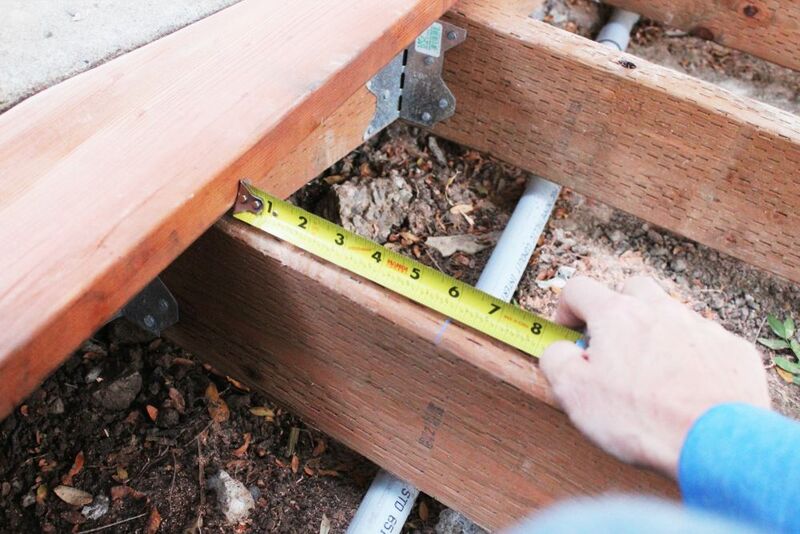 Check for alignment with your chalk line EACH TIME you attach the board to a joist. 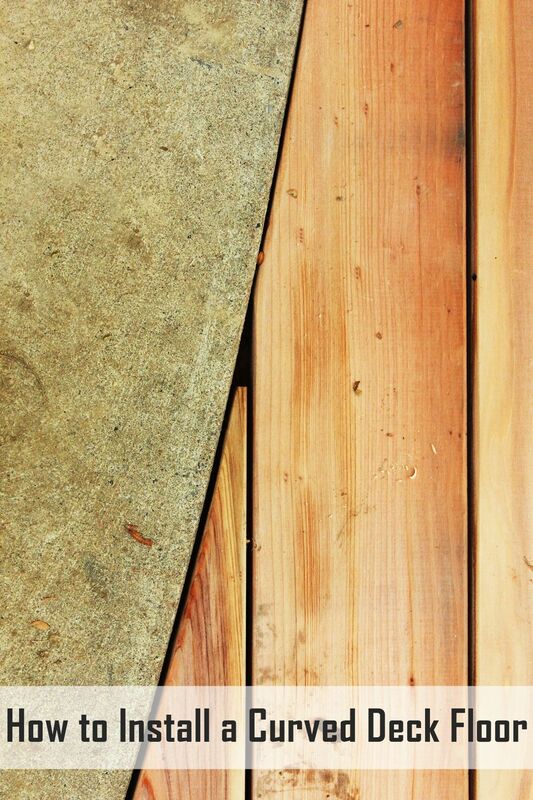 As your first deck floor board, this one has to be perfectly parallel and aligned. It can’t be overstated, how important this is, to the outcome of your deck overall. 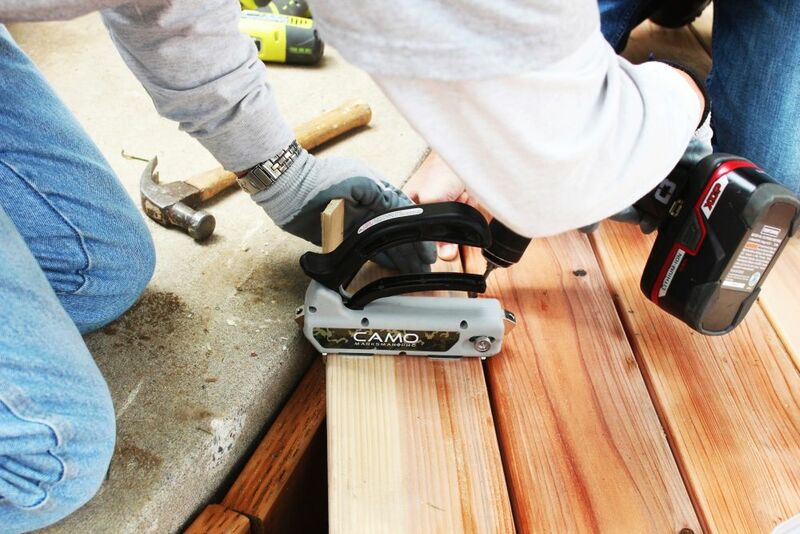 On each joist, attach your Camo deck spacer by pulling the lever, sliding the guides over the edges of your board until the spacer is flush with the board, and releasing the lever to clamp it in place. Then install the screws. 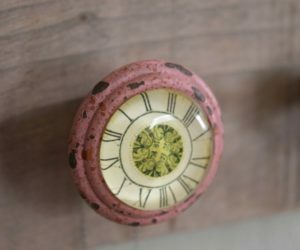 The beauty of this tool is that the screws go in at an angle, slightly below the top of your board, so it is a very secure attachment while being practically invisible at the same time. Win-win. 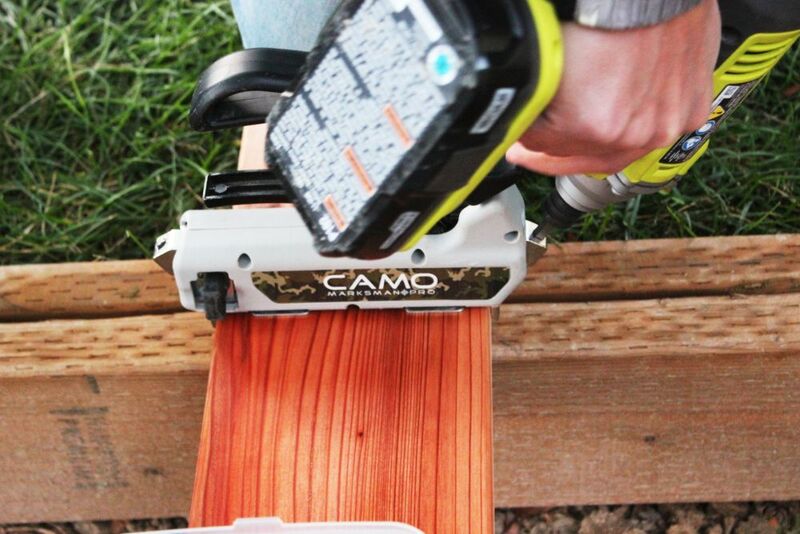 So, let’s take a closer look at the Camo deck spacer. 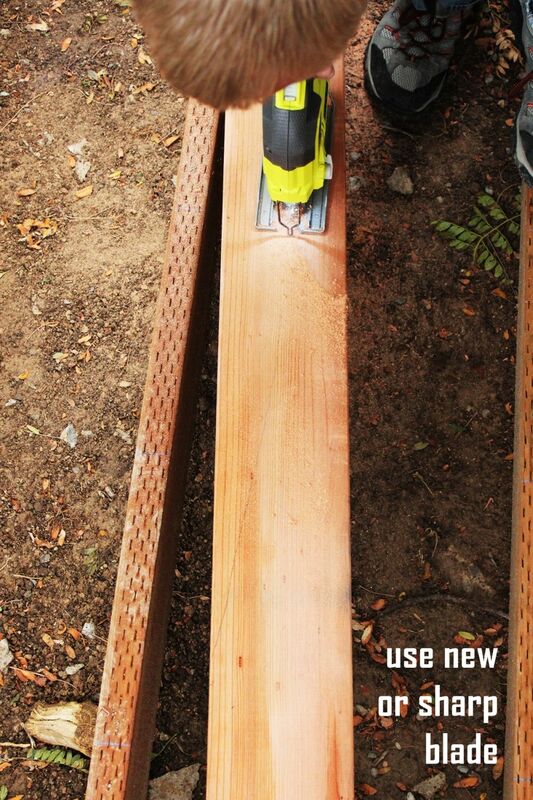 Install it with the lever so it is directly over and parallel with the joist board. 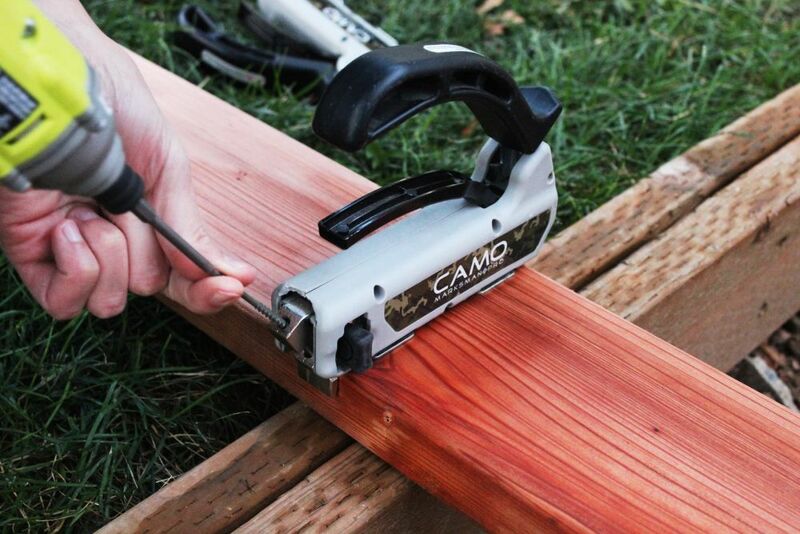 Install the screw all the way down until the Camo drill bit stopper touches the deck spacer; in other words, until it can’t screw in any more. 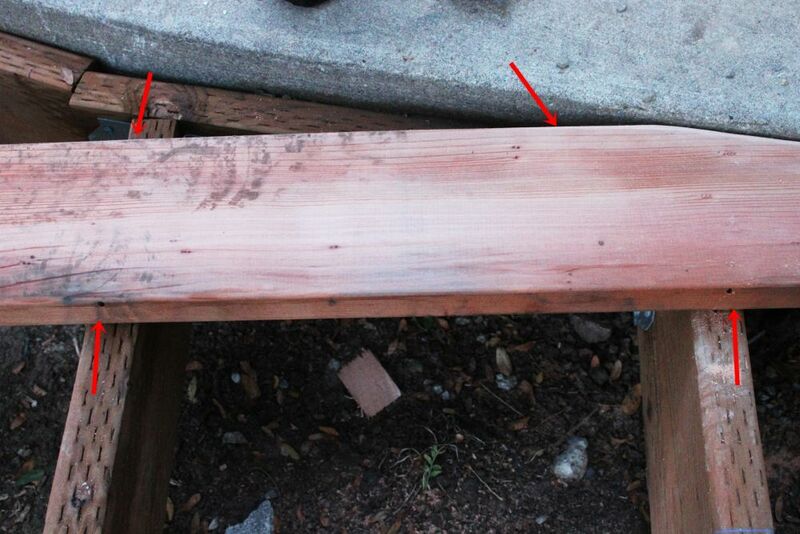 Then, without moving the deck spacer, do the same thing through the screw hole on the other side of the deck spacer. 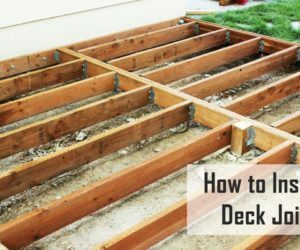 Remember that on the outer deck frame, where you doubled up your pressure treated lumber boards, you’ll want to attach the deck board to both framing boards, on both sides. 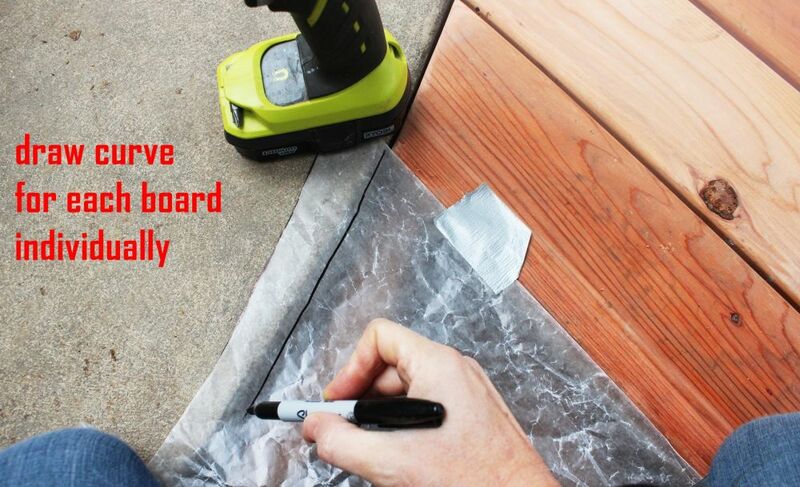 Moving inward and down along your curve, you’ll use this exact same wax paper/sharpie method for every board. 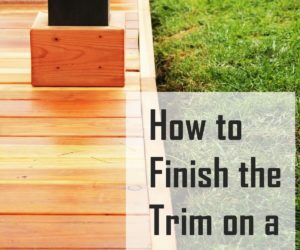 Be sure to mark, cut, and install each board individually before moving onto the next one. 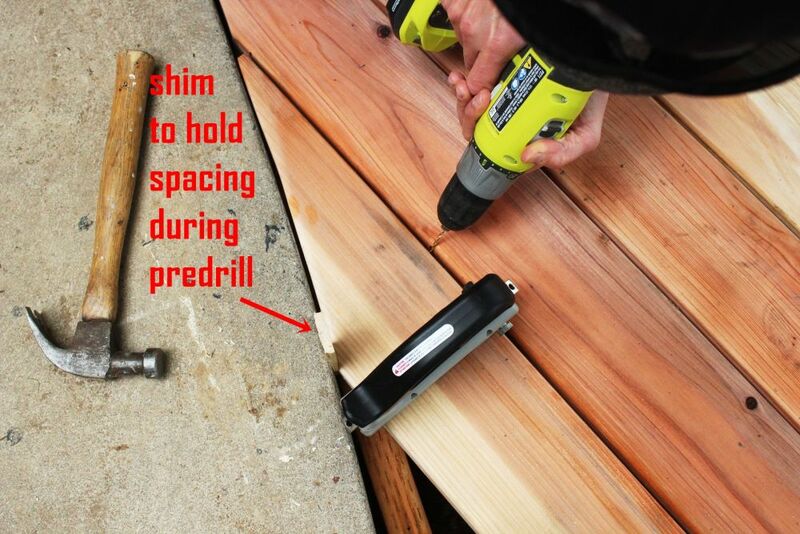 Keeping the shim and deck spacer in place, predrill all the points you’ll need. 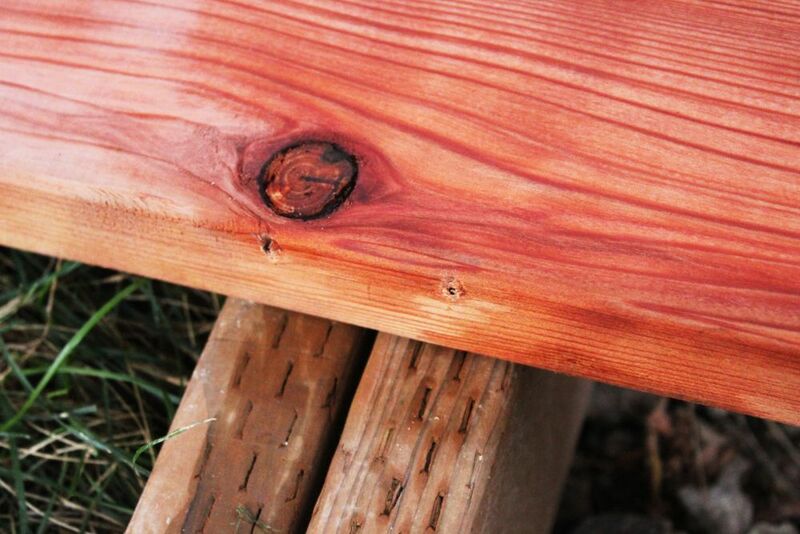 In this instance, due to the placement of the joists and frame, three holes were predrilled for the end of this particular curved board. 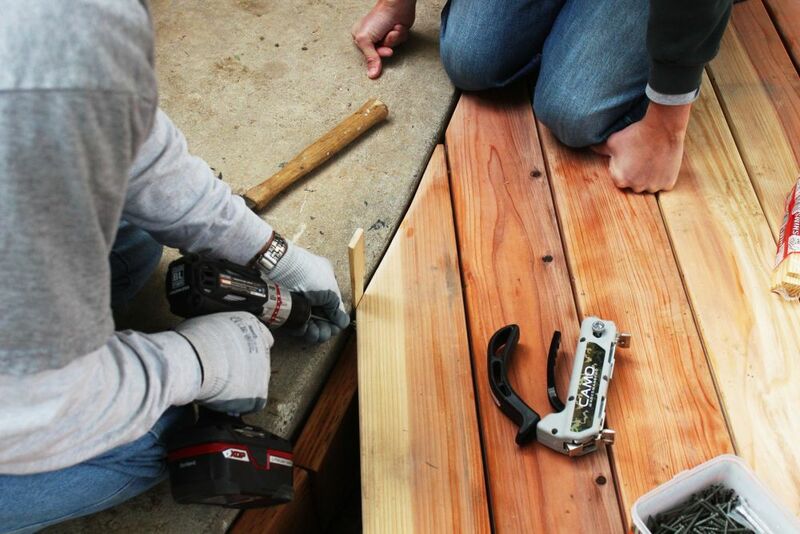 Install the screws with the deck spacer and shim in place for as long as possible. 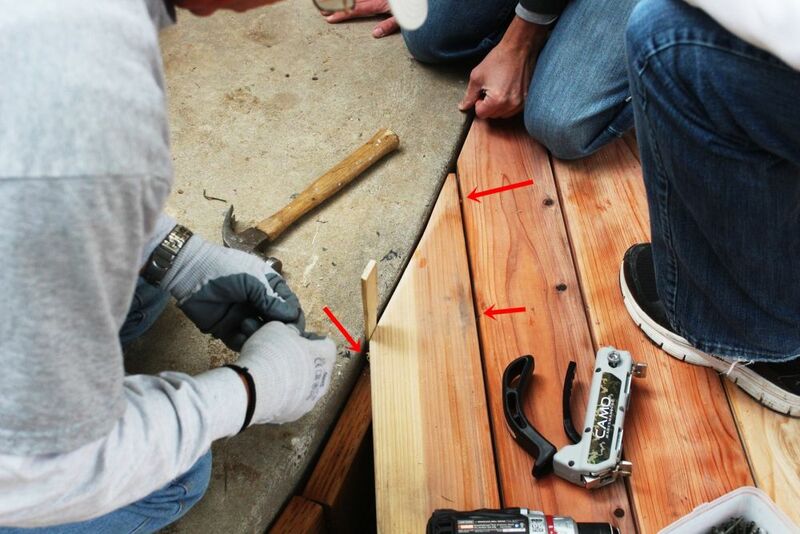 If you find you have to move the deck spacer in order to get a screw in, simply install the others first, then remove the deck spacer before installing the last screw. 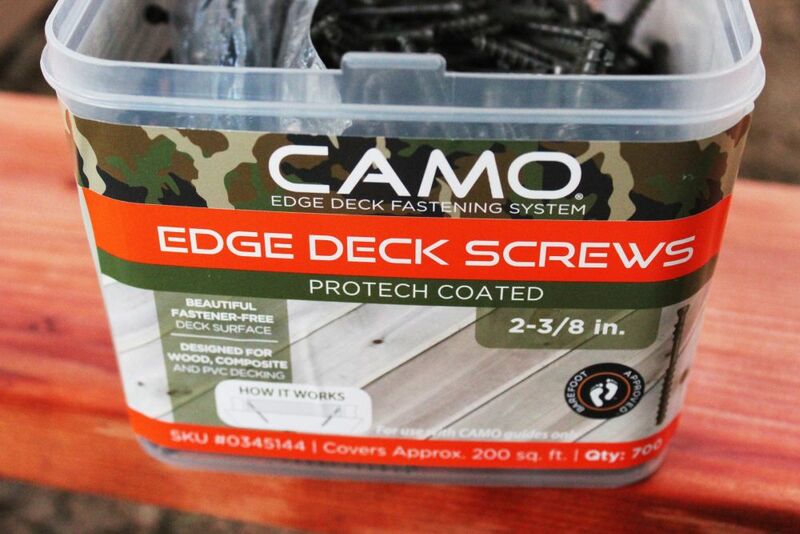 Remember as you are predrilling and installing screws that the angle of the Camo deck spacer screw holes is fairly sharp. 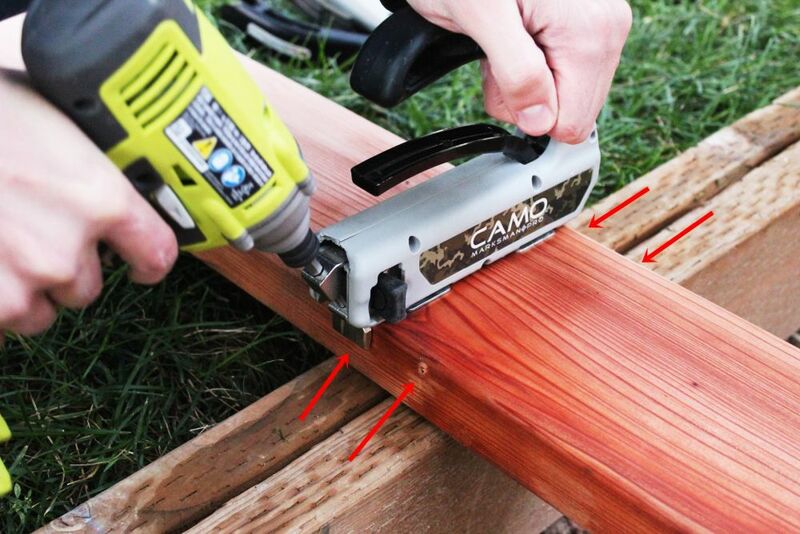 Try to mimic this angle in your predrilling along the curve as best as you can, because that is what will give the screws the best security. 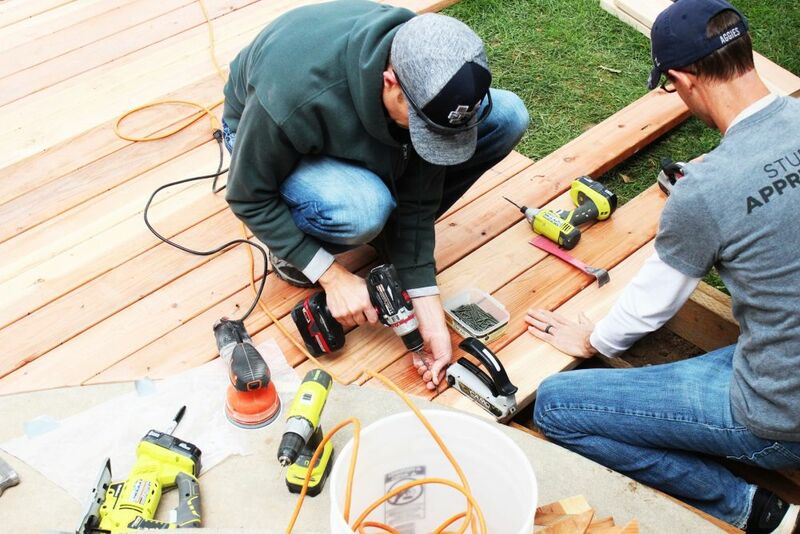 We recommend using two or three people to install each board – one on each side of the deck spacer to screw in the screws, and one to ensure the board is securely parallel and spaced evenly and precisely before screw installation even happens. 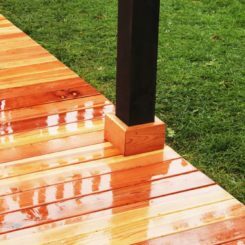 Leave the boards to overhang the frame at this point; we’ll cut them all evenly at the very end of your deck floor installation. 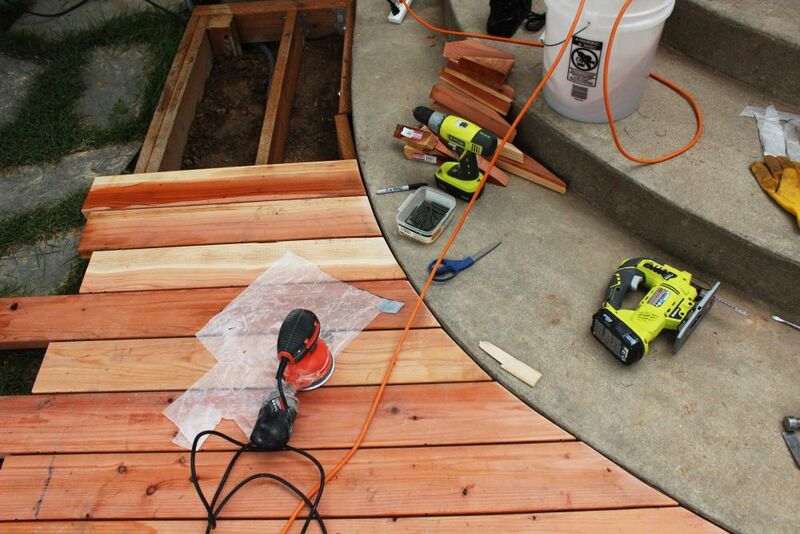 Piece by piece, you’ll get your curved deck installed. It looks beautiful when you’re done. 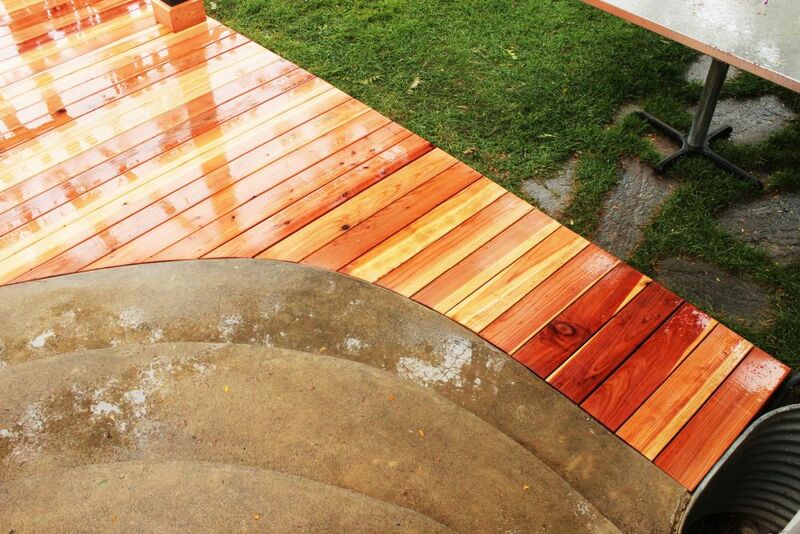 Even if it rains right after installation, you can still appreciate the beauty of a curved redwood deck, right? It’s not easy, and some curves are probably going to give you fits, but it’s absolutely worth it in the end.